NICK HOOPER is a BAFTA award winning and Grammy nominated film and television music composer who has written scores for two HARRY POTTER films “The Order Of The Phoenix” and “The Half Blood Prince” (for which he was nominated for a Grammy). The soundtrack for “The Half Blood Prince” is critically acclaimed and the most successful album of the film series debuting at number 29 on USA Billboard chart. In addition Nick has scored award winning TV productions such as “Land Of The Tiger”, “Prime Suspect” to films such as “The Girl In The Cafe” and “My Family”. Nick also was the recipient of a Richard Attenborough Film Music award from Classic FM for “Film Music Of The Year”. Nick has been into the world famous Abbey Road studio in London (where he previously recorded both of the Harry Potter soundtracks with 110 musicians) and recorded his new solo album “6 Strings” which he describes as “Irish music and its affinity with the guitar”. Hooper has a delicate sense of phrasing and his rearrangements of these classic tunes, many centuries old is both illuminating and refreshing. His reworkings of a number of Turlough O'Carolan tunes are particularly noteworthy. This is a soft and mellow album so don't expect to be blown away by guitar pyrotechnics. The melodies venture from sad and lamenting to jovial and upbeat so there is a rich treasure trove of riches to be savoured. Describing individual tracks on an album such as this (only one instrument used) seems a tad pointless but I will say Hooper's playing is wonderful throughout the album. He is clearly an accomplished player and any fan of acoustic guitar music should consider 6 Strings a must purchase. Nick Hooper is a BAFTA award winning and GRAMMY nominated film and TV music composer. He is best known for writing the scores for 2 Harry Potter movies - 'The Half Blood Prince', and 'The Order Of The Phoenix'...This lovely solo acoustic guitar album of Irish folk songs was recently recorded at the legendary Abbey Road Studios in London (where he previously recorded the Harry Potter soundtracks with an impressive 110 musicians). Of the fourteen tracks on '6 Strings', there is a tune, 'The Silver Lining', by John Dipper, and thirteen sets of Irish tunes, eight traditional and five attributed to O'Carolan. Recorded and mastered at Abbey Road, this is a definitive collection of Irish melodies. Needless to say, the choices are superb, the arrangements sublime, and the playing superlative. Up to this point in time, Great Britain's Nick Hooper is best known for the scores he wrote for the Harry Potter films The Order of the Phoenix and The Half Blood Prince. 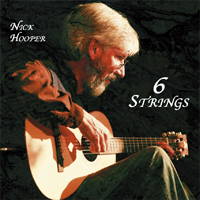 In stark contrast to what you might expect from a solo album, 6 Strings presents Hooper playing all by himself on an acoustic guitar...presenting his interpretations of Irish folk tunes, plus a song by an English fiddler. A quick glance at his web site reveals that he also writes stories and novels. This album captures the man doing what he obviously loves doing...playing solo guitar. These recordings were captured at Abbey Road Studio 2, thus the sound quality is exceptionally warm and real. A man in Nick's position could easily release a grandiose album chock full of overproduced orchestral music...which is what most people might expect. But instead he chose to take a completely different approach, doing what he prefers to do rather than what others expect of him. The gamble pays off, as this disc is chock full of ultimately rewarding music that is inspired and slightly cerebral. Fourteen tracks here, all played with impeccable style. Our favorites include "The Lament of Owen Roe O'Neill," "March of the King of Laois," "Fanny Power," and "The South Wind."